Election Mayhem: What Happens If There’s an Electoral Tie? Most people will agree, the 2016 presidential election has been the craziest in modern U.S. history, and there are millions of Americans who are looking forward to its end. While the threat of possible legal challenges looms in the event of close races in key battleground states, what would cause voters’ heads to collectively explode is if there is a 269-269 tie in the Electoral College. 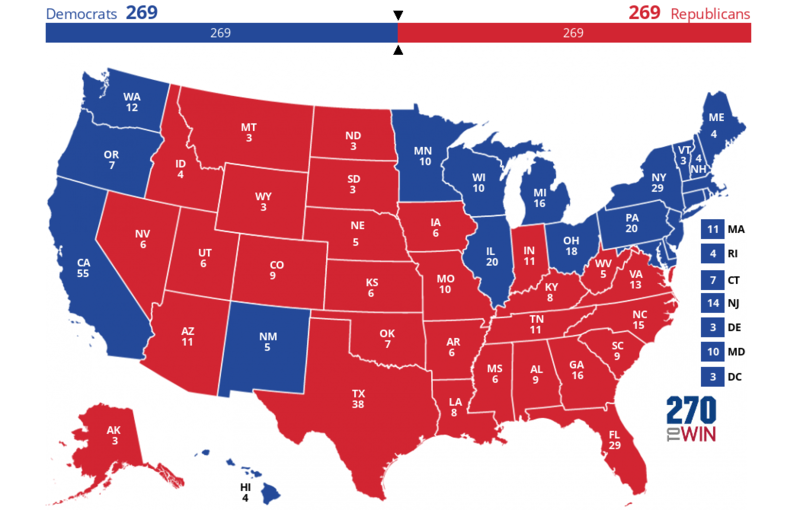 In fact, according to 270towin.com, there are 97 possible combinations with the current 13-state battleground outlook, with Trump taking at least one electoral vote in Nebraska and Clinton taking at least one in Maine. If we treated Maine and Nebraska like they were fully in play as well (extremely unlikely), the number of combinations jumps to 377. So yes, it is possible. The question then becomes, what would happen? There are additional stipulations laid out in the Twelfth Amendment and the Twentieth Amendment. The results people hear on election night or the Wednesday after Election Day are projected results. They are not official. The electors will meet on the third Monday of December, which is December 19, 2016. Roughly half the states have laws that require their electors to vote for the candidate that won the popular vote in their state. In a state that does not have such laws in place, an elector could decide to change their vote if the popular vote is very close. There is an ongoing movement to create an interstate compact that would reform state electoral laws to honor the national popular vote. Every state in the compact would award their electors to the candidate who wins the popular vote in all 50 states, plus the District of Columbia. However, to go into effect, the National Popular Vote Plan needs participating states to hold a majority in the Electoral College combined. According to FairVote, only 10 states and DC are currently signed on to total 165 electoral votes. In the event of a projected tie in the Electoral College, one elector could change everything by switching their vote. In this scenario, the vote would then become 270-268, giving the majority to one campaign over the other. The lack of restrictions on electors in some states means that not all of them are bound to the popular vote in their state. Most experts say this is highly improbable, but there have been instances (though rare) in the past when an elector has changed their vote. Most political analysts speculate that if there is a tie in the Electoral College the election would remain undecided until the new Congress convenes in a joint session in January 6, 2017, to count the electoral votes. This is something that happens after every presidential election and if neither candidate has 270 electoral votes then that is when things get really interesting. The constitution gives the authority to select the new President of the United States to the U.S. House of Representatives if there is an electoral tie. The House does not select the presidential ticket or the campaign. House members would pick the president only because the constitutional authority to select the vice president belongs to the U.S. Senate. Imagine a situation where Republicans keep the House, but cannot keep control of the Senate or hold it to a 50-50 split. It is entirely possible that there could be a divided White House. How Likely is an Electoral Tie? Considering it has never happened in the history of the United States, the odds are incredibly slim. There are only a handful of combinations that could produce a tie in the vast amount of possible electoral outcomes. Statistically, it is highly improbable even without looking at where the candidates stand in each state. It seems more likely that if both major party candidates were denied an electoral majority, it would come as a result of a third party or independent candidate taking enough electoral votes in one or two states to deny anyone the 270 needed to win. And while that is also not likely, it has been a crazy election cycle with the two most unpopular and untrusted major party candidates in modern U.S. history. Just like in an electoral tie, the election would then go to the U.S. Congress on January 6, 2017.